Today marks the seventh anniversary of this blog! Seven years ago, the blog had 35 hits. These days it averages about 5,300 hits and the total hit counter is fast approaching 7 million. The popularity of Femulate is very gratifying, but after seven years, I occasionally get the itch to pull the plug and take a break. Then I would not have to worry about posting something new each day. Actually, I would not have to worry about posting four new things each day: The Femulated and Femulate Her images, the blog text and an image to accompany the text. What keeps me going are the positive e-mails I receive about the blog especially those e-mails that thank me for inspiring someone to get out of the closet and experience society as the woman they really are. Those success stories fulfill the goal of this blog and I like that! So keep those e-mails coming and I will do my part. We all deserve a vacation from time to time. Perhaps something that involves a beach a bikini and fruity drinks. It is a big commitment, and with such popularity comes responsibility, but yes everyone deserves a break sometimes. I know it takes a lot of organising to get posts prepared in advance when going away, but it is worth it to have a break. Thank You so much for your gift to all of us of your lovely BLOG Femulate. We readers really appreciate your love and dedication. You certainly deserve a break from the daily "grind". So, I think your devoted readers should be perfectly OK with you skipping one or more days whenever you are overwhelmed. Maybe, you could go to a two-a-week or three-a-week posting schedule (like, Mon-Wed-Fri, for example). 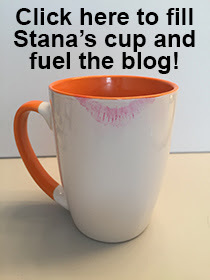 Anyway, we LOVE you Stana, and your beautiful BLOG. Whatever posting schedule is most convenient for you is certainly OK with me (and hopefully your other followers). it is not easy to maintain a blog for 7 years, much less if it is done by just one person. It is a very hard work, but be sure that there is a lot of people out there who really appreciates it. You have so many devoted readers because your blog is so good and you always look so nice and well dressed in your pictures that you're a model we can all aspire to femulate. But of course you need a break, can't think of how you get the posts done and still take care of all that life demands. You go girl! So downshift a bit, maybe three days a week, or take week off a month, whatever is best for you. A little absence may just make us all look forward to it that much more. Thanks for all great work. Your loyal following knows the genuine article when they see it. You reach inside and comfort the real person we know exists. You nurture the woman in us, sometimes better than we do to ourselves. A true mentor. Joan has the right idea, never a bad time to bikini up to a rum whatever and soak up a little sun. Please do come back though! It would not be possible to calculate the good that you have done for so many of us. We all need a break from the responsibilities of the daily grind and while your wonderful blog is clearly a labor of love it is also clearly a lot of labor. Stana, I may have been one of those original 7 hits :). I've been with you from the beginning or close to it. Congratulations on an excellent blog!